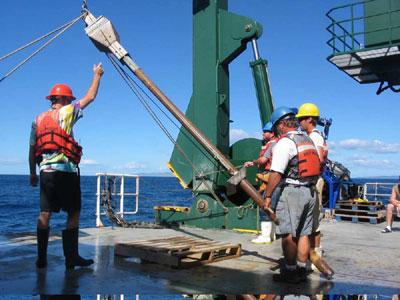 A gravity core is used to collect samples of sediments from the upper levels of the seafloor, as in this work for the MARGINS Source-to-Sink initiative in the New Zealand focus site. The gravity corer device comprises a long metal pipe usually lined with a plastic sleeve and typically 4 inches in diameter, and heavy masses which are visible at the top of the picture. It descends through the water column under its own weight, hence its name, but a tripping device is activated just above the sediment-water interface to allow a measured free-fall. The heavy masses at the top push the pipe into the seafloor to capture the sediment. Image courtesy of JP Walsh, ECU.